Welcome back to the sixth chapter in this series of articles on European Transformers released by MB (Milton Bradley). 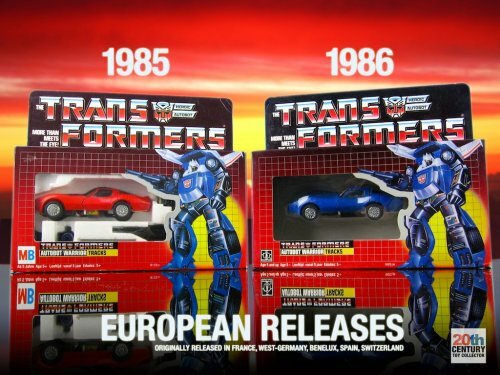 In the previous five chapters we looked at the very exciting history of the introduction of Transformers in Europe and how some of the MB Transformers are very closely related to European Diaclone releases by Ceji Joustra. We solved some long standing mysteries along the way, like why the first wave of MB Transformers had so many Autobots absent and why MB’s Autobot cars came in styro foam inserts. We also solved a long standing mystery as to why Jetfire was initially the leader of the Autobots in Europe and not Optimus Prime. Does that mean we’re done? Hell no! In this chapter we’re going to take a look at some further exciting weird and wacky stuff, courtesy of MB. In this specific chapter we will be looking at some of the packaging “mix ups” that MB managed to sneak into their line of Transformers. The term “mix up” is putting it euphemistically. The term “packaging screw ups” seems much more apt, because some of the packaging snafu’s they made really boggle the mind as you will see! We’ll be looking at three different packaging mix ups in this article. The first one is a well known and very popular variant, which most collectors will immediately associate with the MB line. The second one is a lesser known, but also highly coveted packaging mistake among the serious MB Transformers collectors. And the third one…. well, the third one is a mix up that is really the most outrageous of all three and is one that, to this day, most Transformers collectors have never even heard of, and that includes most MB Transformers collectors! So there’s something here for everyone. Let’s set our time machines to 1985 once more and kick things off with the first one: none other than collectors darling Red Tracks! Much has been written and said about the MB red Tracks over the years, including here on this very website. Some of it was correct, some of it was mostly correct and some of it was just plain wrong. 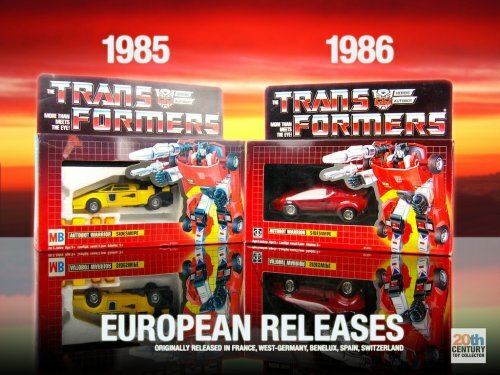 A lot of information has been unearthed about the vintage 1985 Milton Bradley (MB) branded European Transformers releases in the past few years, which has finally allowed international Transformers fandom to place things into context and to paint the definitive picture of the history of this variant toy. Love him or loathe him, Red Tracks is without a doubt the single most popular item from the MB Transformers line. Even though there are several MB Transformers that are even harder to find inside their original packaging, Red Tracks’s reputation as the most expensive MB Transformer on the collector’s market is uncontested as of yet. And who can blame the market for it? It’s one very cool looking toy! So hey, what’s so special about this red coloured Corvette Transformer? Well, that’s because it’s supposed to be blue and not red! You see, the Transformer called Tracks is a blue Corvette. And in most places of the world where this Transformer was sold back in the 80′s of the 20th century it was indeed available as a blue toy. 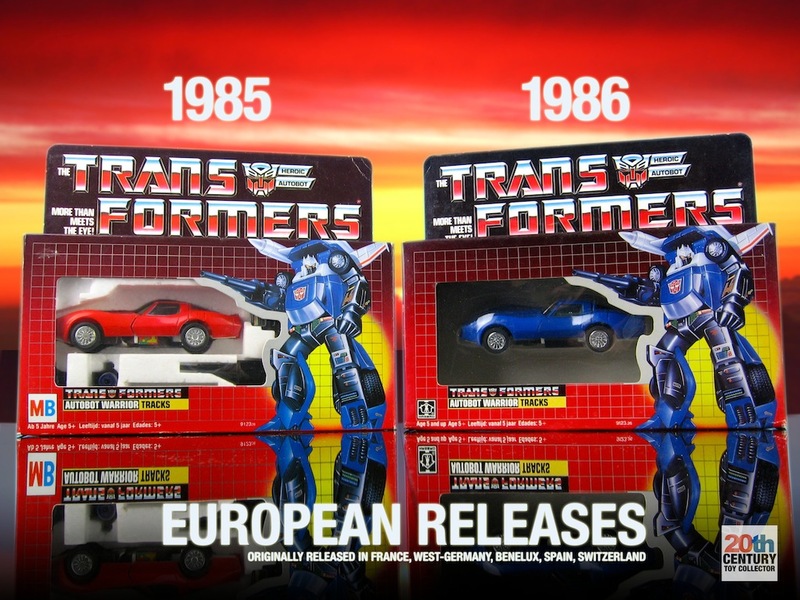 Yet, something screwy happened in mainland Europe in 1985 right around the introduction of Transformers here. A specific set of circumstances came together in mainland Europe, which ultimately led to the peculiar occurence of a red Tracks toy being sold here instead of the blue Tracks that we all know and love!! So how did this error occur? Well, if you’ve read the previous chapters in this article series you will already be quite aware of the exact reason, but it doesn’t hurt to refresh the old memory, so here’s a short recap. 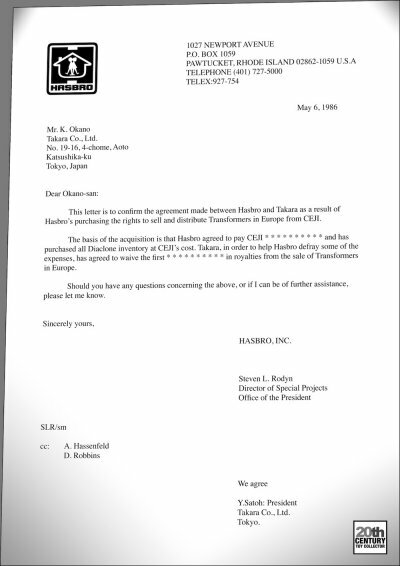 Transformers were originally invented not by Hasbro, but by a Japanese toy company called Takara. The toys were also called Diaclones and not Transformers. 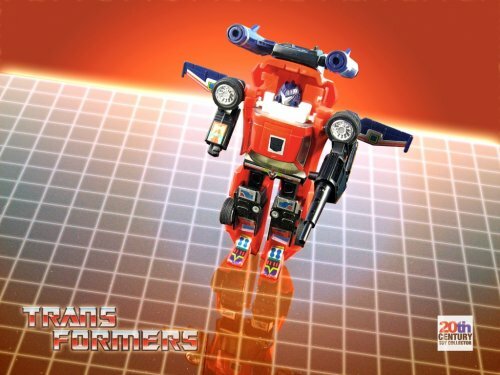 In 1983 Hasbro entered into an exclusive agreement with Takara to sell these transforming robots in North America and in the process renamed them as Transformers. The Transformers were released in North America in 1984 and became a big hit. After the success of the launch in the US and Canada, Hasbro planned to expand the Transformers line into Europe. Hasbro had just taken over board game and puzzle giant Milton Bradley (MB) in 1984, which enjoyed a major presence in Western Europe. So it was decided that MB would take care of the introduction of Transformers in mainland Europe, which was slated for 1985. So how does the red Tracks fit into this story? Well, because the Diaclone car robots often came in various or different colours than Transformers it happened that the model that Tracks is based on (the C3 Corvette Stingray) came as a red toy in the Ceji Diaclone line. Because MB took over Ceji’s stock of Diaclones, they only had red Corvettes. It was undoubtedly decided that throwing these away just because the colour was wrong was not economically prudent. So MB decided to just sell the red Corvette as Tracks, even though the colour of the toy was incorrect. A disclaimer that you will often find nowadays on the packaging of toys (and other consumer products) is “actual colours may vary”. That means that the actual colour of the toy may be different from the colours that you see on the packaging. Well, that certainly holds true for MB’s red Tracks. As you can see from the photo below, Tracks is depicted as being blue on the packaging. The toy inside, though, is definitely red. 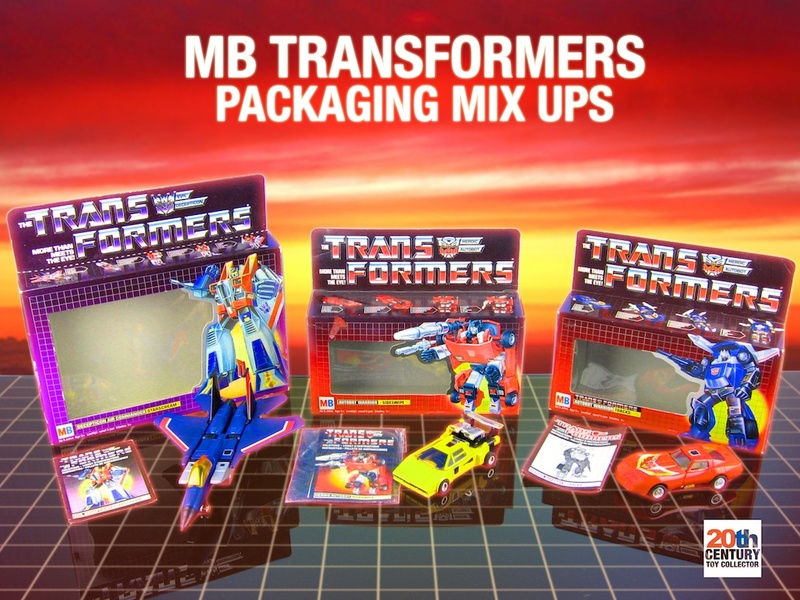 Although the afforementioned disclaimer is not present on any of the early Transformers packaging, it is widely accepted that the colours and details of actual production toys could vary from what was shown on the packaging. This is primarily because the photos featured on toy packaging are often of early versions or even prototypes of toys. For a multitude of reasons the eventual production version of a toy can look slightly different from the prototype or early test shots of the toy. Due to an increasingly litigious world toy companies have started including the afforementioned disclaimer on the packaging. The reasoning is that although some colours may be different and the toy may look slightly different at certain points, as long as it’s basically the same toy it shouldn’t matter. And that was certainly true for red Tracks. Although MB’s red Tracks was the wrong colour, the included instruction booklet could be used without problems to transform the toy. The included sticker sheet could also be used, because the shape of the toy was identical to the regular blue Tracks. A question that sometimes pops up is whether MB ever fixed the problem and whether a blue MB Tracks was released in Europe? Strictly speaking the answer to that is “no”, although we did see a proper blue Tracks released here in Europe. 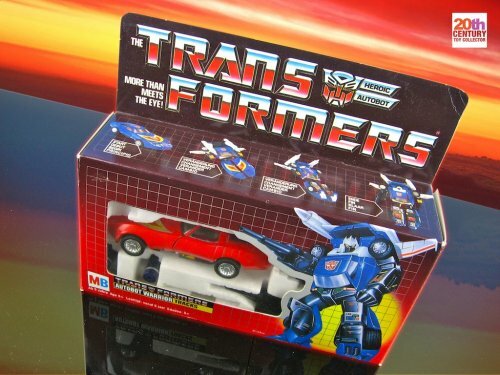 That regular blue Tracks was released in mainland Europe, but this only occurred in 1986 and it did not come with an MB logo on the box, but with a Hasbro logo. 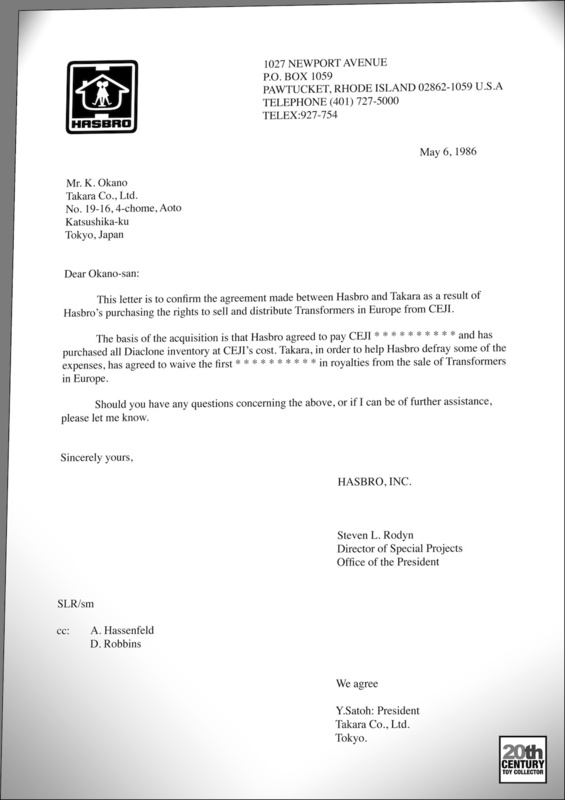 From January 1st, 1986 MB stopped using their own logo on the packaging of Transformers toys in Europe and started using the logo of their parent company Hasbro. So although Europe did see the mistake corrected, the blue Tracks did not come in MB branded packaging, but in Hasbro packaging. Here’s a photo of the 1985 MB branded red Tracks and the 1986 Hasbro branded blue Tracks side by side. By the time the blue Tracks was released MB was getting all their Transformers stock directly from Takara and was tapping into the same production lines that the US market was. So if there only ever was a red MB Tracks, why didn’t MB change the packaging to show a red Tracks on the box? Well, the most likely explanation for that is time and cost. The European packaging of vintage Transformers toys is usually based on the original American packaging, but is slightly adapted for the European market. These changes are mostly textual, so they are relatively easy to implement. To redesign the actual artwork and make new transformation photos of the red Tracks just for this specific toy would have cost a lot of money and time. Remember, Photoshop did not exist in 1985, so a large chunk of the design process was probably done by hand. There is a trace of red Tracks visible on the packaging though, although it is not exclusive to the Tracks packaging. 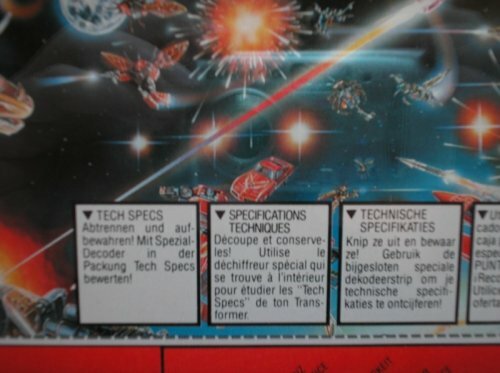 On the back of the box we see the 1985 battle scene. On there, if you look closely, you will find a red Tracks!! There is virtually no debate as to the authenticity of this being a true packaging mistake variant (as opposed to someone simply sticking a red Corvette inside a Tracks box). For one, there have been many eye witness accounts of people seeing MB’s red Tracks in the stores in the 1980s from reputable Transformers collectors. This on its own is not exactly hard evidence, but over the years several MIB (mint in box) finds have been made from unsuspecting sellers who had owned the toy since childhood and better yet, a couple of MISB (mint in sealed box) specimens have also turned up, which is almost as good as the evidence gets. Placed against the background of the deal that took place between MB and Ceji in 1985, which explains why Tracks is red, we have a pretty complete picture of how this variant was created. The MB Red Tracks is hard to find, especially complete with its original packaging and paperwork. Red Tracks’s packaging carries a date code of August 1985, which indicates the toy might have been available in stores shortly thereafter. Theoretically the variant will have been available in the countries where MB was responsible for the distribution of Transformers, which in 1985 were France, West-Germany, the Benelux, Spain and Switzerland. This does not automatically mean that every Transformers toy was available in equal measure in all those countries. Of all the “MB countries” a relatively high number of Red Tracks finds have occurred in the Netherlands, so it was definitely available there. The MB Thunderscream came inside MB Starscream packaging and included Starscream’s instruction booklet and Starscream’s sticker sheet. 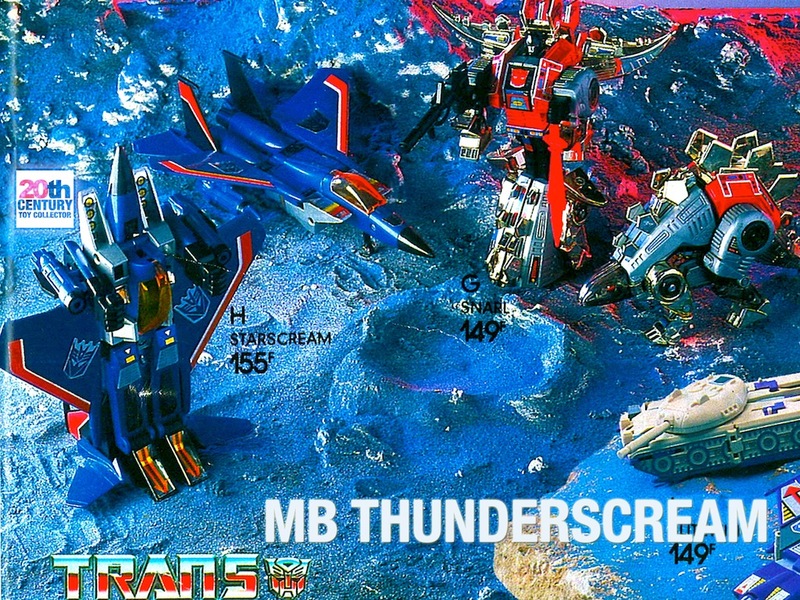 Contrary to the MB Red Tracks, of which several specimens have survived in their original packaging, the MB Thunderscream is much rarer and has only surfaced twice publicly (as far as we know) on eBay, both occurrences in the early 2000s. One of these originates from the Netherlands and was bought originally in the 1980s in a toy store in Amsterdam. 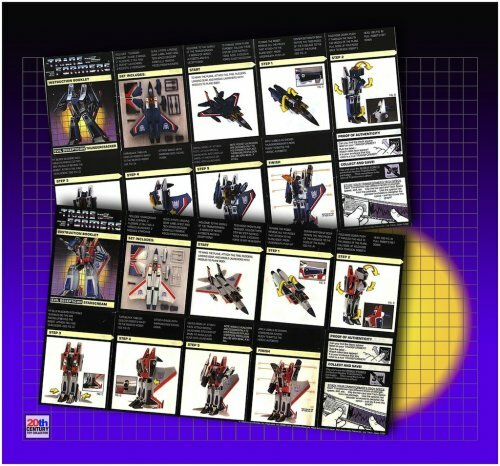 The other was purchased by ex-Transformers collector Chuck Liu who purchased the item from France, which is the item that is shown in the photos above and below. The stickers on that jet are not Thundercracker stickers, but Starscream stickers. Just let that sink in for a second….. This is a photo from a European mail order catalog that was made in 1986 that shows a Thundercracker that came with a Starscream sticker sheet and is advertised as being Starscream. 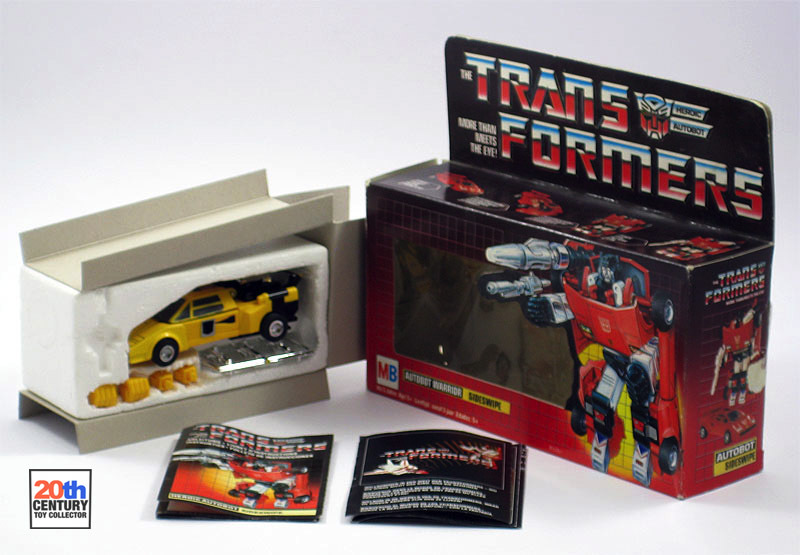 If there is any remaining doubt in the vintage Transformers collectors community that this is not a packaging variant, this photographic evidence puts this matter squarely to bed…. (if anything else, in my opinion it now puts the burden of proof on those who do not believe this was a packaging variant!) Props to Maz and Chuck Liu for calling this one ten years ago, when it was not the popular stance. But there is even more to this story in my opinion. 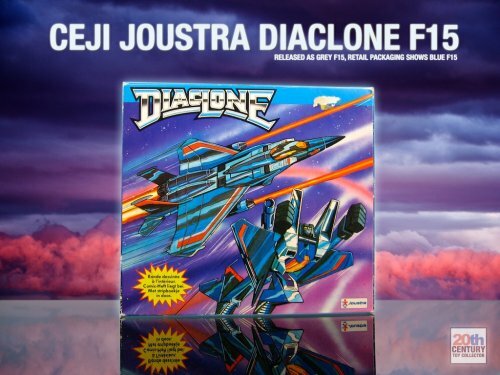 If we go back in time just one more year to 1984 and look at Ceji Joustra’s first wave of Diaclone toys we can see that the F15 with Starscream colours was part of that year’s line up. It is shown in various stock photos in Joustra Diaclone catalogs and on the packaging. However, if we look at the beautiful illustration on the front of the Joustra Diaclone F15 packaging we do not see an F15 in Starscream colours, but…. you guessed it: Thundercracker colours! Now, isn’t that funny? Here we have two European toy companies, Ceji and MB, who sold F15 jet robots and both of them made a mistake. Ceji sold grey jets inside packaging that showed a blue jet and vice versa we have MB who sold blue jets inside packaging that shows a grey jet!. Coincidence? Could be, but given the fact that the entire wave 2 of MB Transformers came from Ceji, to me it’s almost certain that Ceji were the actual source of these MB Thunderscreams. And boy, that opens a whole new can of worms…. Why? Well, anyone reading this article who is able to digest all the nerdy information presented here -and remain sane after doing so- might ask themselves the following question: Does that mean there was also a blue Ceji Joustra Diaclone F15??? The jury is still out on that one… It is quite possible that Ceji only received a shipment of blue F15′s very late in the game, like in the first half of 1985, just before their stock was acquired by MB. That would mean they maybe never got around to releasing any blue F15′s to retail and all of them ended up as MB Thunderscreams. Looking at the Red Tracks situation it was clear that MB was not overly concerned with colour variations, so blue jets or grey jets were all fair game in their quest to pump as many Transformers into mainland Europe as they could in 1985. There’s one more piece of information that I would like to highlight regarding MB’s Thunderscream (and Starscream) packaging. I believe that Ceji Joustra was (at least partly, but probably completely) responsible for repackaging and rebranding the Ceji stock of Diaclones into MB Transformers. 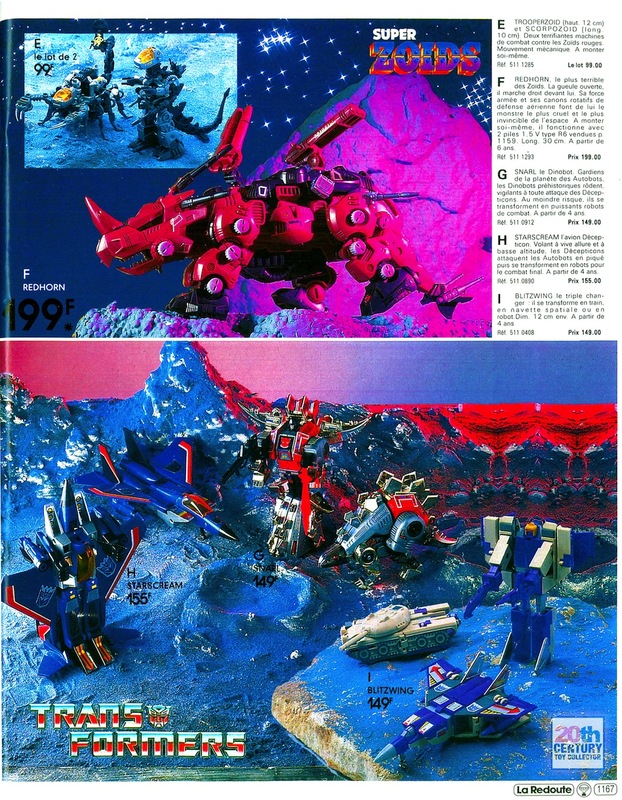 The packaging of all the ex-Ceji wave 2 MB Transformers was printed by a local printer close to Ceji’s subsidiary Joustra’s location and there are several packaging related similarities between the Joustra Diaclone line and MB’s wave 2 Transformers, (which are detailed exhaustively in chapter 4). 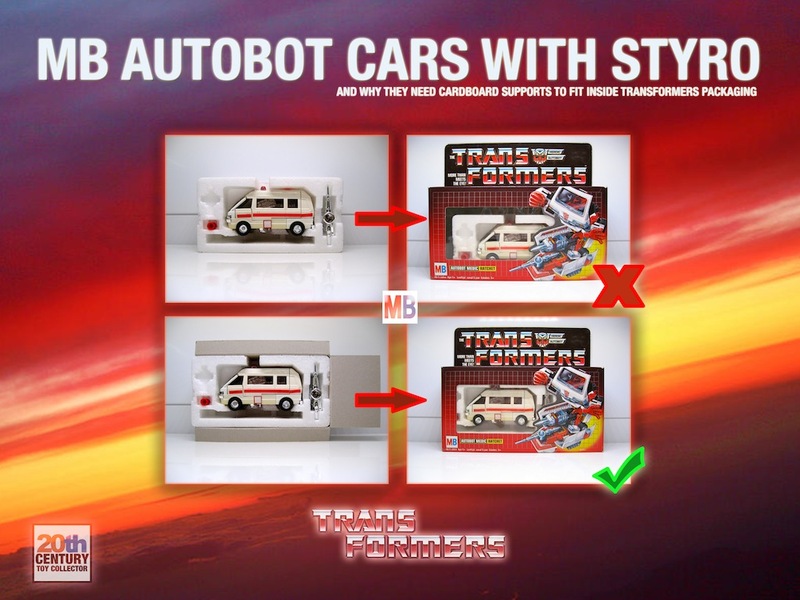 For the Autobot cars Ceji thought of a simple solution that would allow them to reuse the original styro foam that the Autobot cars came in by creating a simple piece of cardboard to hold it in place. There’s no way to cut the styro down to size in such a way that it would fit inside the Transformers packaging, because of the angle at which the toy is placed and the way the holes for the accessories are positioned. So for the rebranding of the Diaclone F15 jets to Transformers jets Ceji could not conjure up another cheap cardboard trick. They needed to create a specific insert. Obviously it was decided to then make it a proper plastic bubble insert, which is how the Transformers were supposed to be packaged. However, Ceji made a small mistake. As you can see in the photo above the accessories bubble of the MB Thunderscream insert is straight. This straight accessories bubble is normally only found on the second series of seeker jets (Thrust, Dirge and Ramjet). 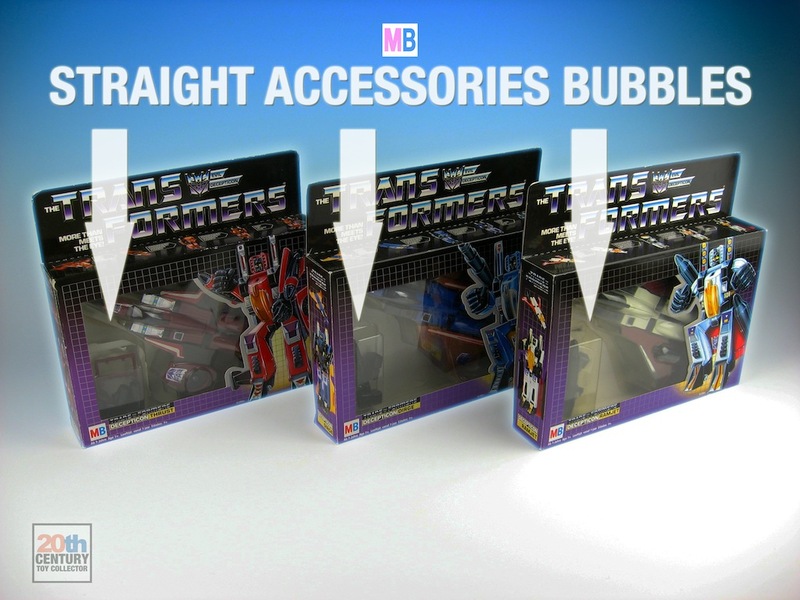 The first series of jets (Starscream, Thundercracker and Skywarp) usually have angled accessory bubbles. I think what happened here is that Ceji looked at the only other available Transformers jets in the MB line, which were Thrust, Dirge and Ramjet and designed their Starscream insert to resemble those as much as possible. Hence the straight accessories bubble instead of the angled accessories bubble we normally find on the first series jets. 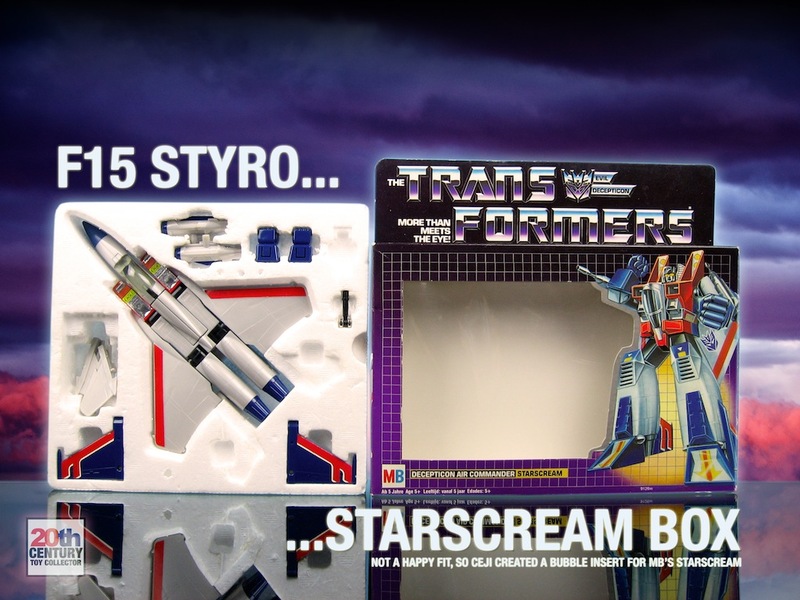 Both Thundercrackers and Starscreams have been sold in MB Starscream packaging. Does that mean that the MB Thunderscream came first and that MB later “corrected” the problem by releasing Starscream properly? I think that’s unlikely. It’s much more likely that MB acquired both the blue and grey F15′s simultaneously and had them rebranded to Transformers as part of the same process. 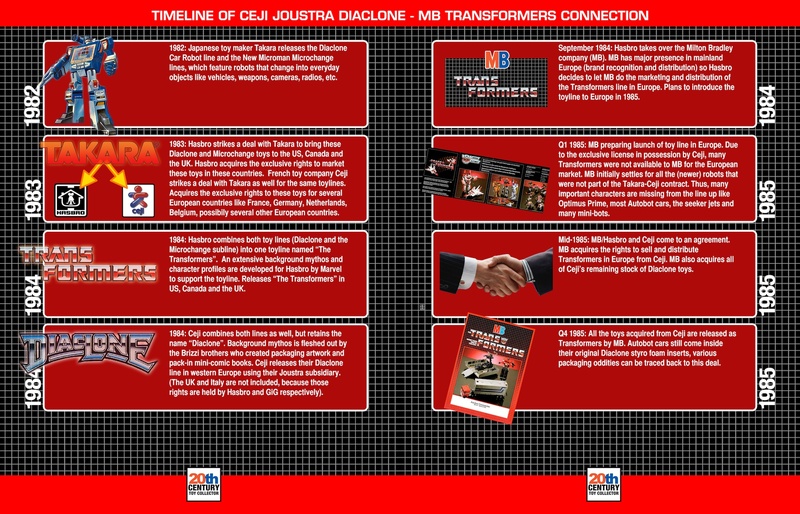 I think the rebranding of Ceji Diaclones into MB Transformers occurred in one big bang instead of it being a process that was spread out over many, many months. The date codes on all the wave 2 boxed MB Transformers certainly seem to indicate so, all of them have the same date code of August 1985, with Optimus Prime being the exception (September 1985). 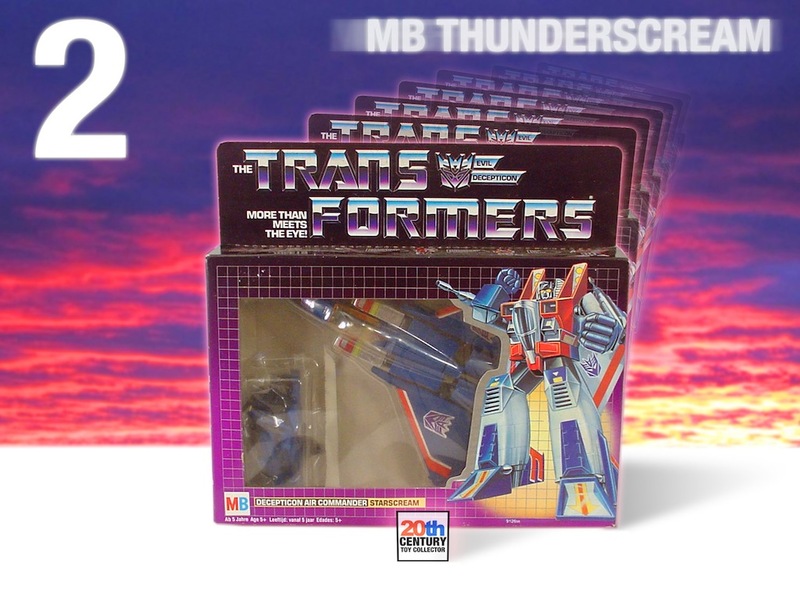 The packaging of the MB Thunderscream and the MB Starscream is identical and they both come with Starscream instructions and sticker sheet (no European quad-lingual translation of the Thundercracker instructions exists). 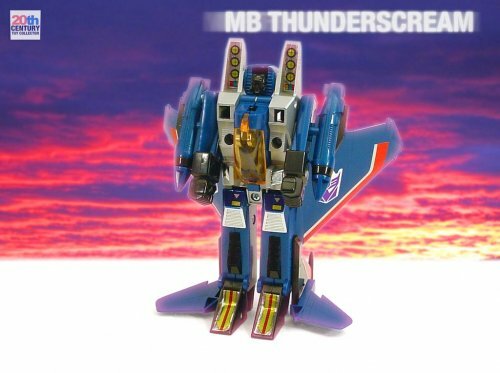 But, if MB knew they had both blue and grey F15 jets, why didn’t they create MB Starscream and proper MB Thundercracker boxes? There are several possible answers to that. The most obvious answer is that it’s cheaper to have just one box created instead of two, especially if the ratio of available blue jets to grey jets was overwhelmingly in favour of the grey jets. On the other hand, it might also have been an honest oversight, rendering the question itself unapplicable (a mistake easily made especially if there were way more grey jets than blue ones). 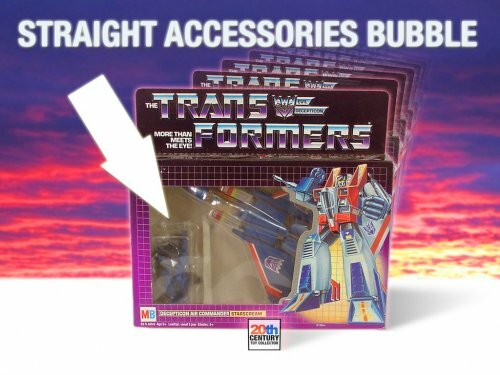 And so we have reached the third and final packaging mistake variant in MB’s 1985 Transformers line, which is the one that is the most baffling if you ask me. Without further ado, I present to you the MB Sunswipe! A casual first glance at the photo above could lead you to believe that this is yet another colour variation, like the MB Red Tracks and MB Thunderscream. You would be right if this were a yellow Sideswipe. But it’s not. It’s Sideswipe’s brother Sunstreaker!! “Oh no they didn’t! !” Yes. Yes they did. And got away with it too. I will even throw some extra fuel on that fire by claiming that I believe that MB never even sold Sideswipes in MB Sideswipe packaging!! I believe that only Sunstreakers were sold in MB Sideswipe boxes. 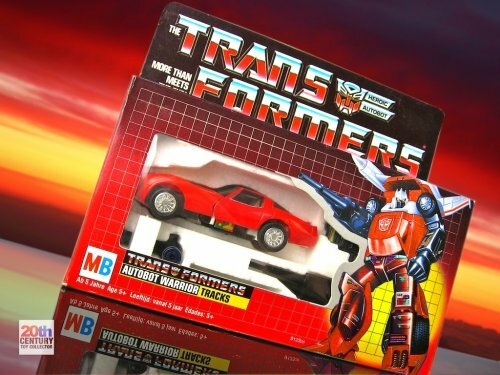 So where do I get the audacity to make such an outlandish claim that not only did MB sell Sunstreakers inside Sideswipe packaging, but that they never sold Sideswipes inside MB SIdeswipe packaging? Well, the first time I noticed something was out of place with the MB Sideswipe release was when I added this particular toy to my collection in 2009. The MB Sideswipe box came with a Sideswipe inside alright, but much to my surprise it did not have a styro foam insert, but a plastic bubble style insert. Here’s a photo I dug up from around that time, which shows the MB Sideswipe as I bought it. That was a bit odd, because it was a relatively well known fact that all Autobot cars in the MB line came with styro foam inserts and not plastic bubble inserts! Being the obsessive person that I am, I thus began the search for a proper Diaclone style styro foam insert for my MB Sideswipe! I had never seen an MB Sideswipe with its styro foam before, neither was there any photo of one available online, so I was not sure what type of styro foam I would need. I had the choice between the original Diaclone New Countach LP500S styro foam insert or the later Japanese Transformers Sideswipe styro (Japanese Transformers cars still came with styro foam inserts, the only difference with the Diaclone styro being the lack of a Diaclone driver cut out). Because I had never seen an MB Sideswipe with styro I wasn’t sure which of the two I would need. Most other MB Autobot cars came in the Diaclone variety (with driver cut out), but MB Prowl did not. The opportunity presented itself for me to buy a Japanese Sideswipe so I did and removed its styro foam and placed my MB Sideswipe inside. There, I thought. At least it looks authentic now…. My MB Sideswipe, now with styro foam insert! Some time passed and in 2011 I started research and writing down notes for the current series of articles on MB Transformers. 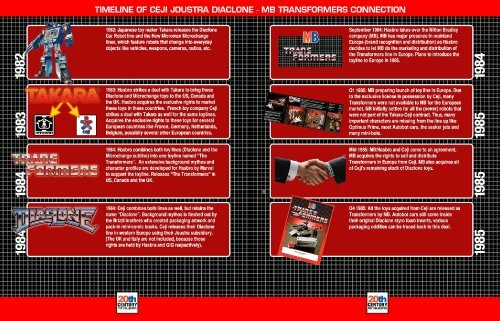 As you might remember, the fourth chapter of this article series was somewhat of a high point, because it disclosed in great detail the relationship between the second wave of MB Transformers and Ceji’s Joustra Diaclone line. 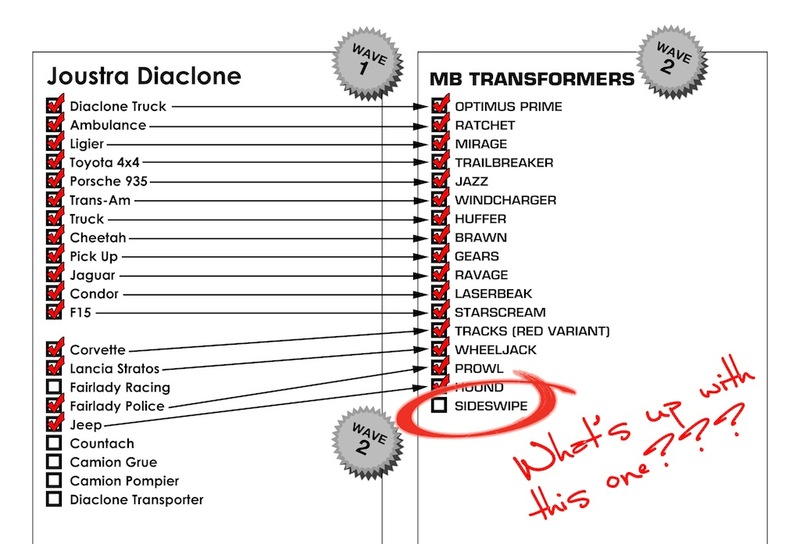 One of the most striking pieces of evidence that I found that suggested that MB’s wave 2 Transformers were actually originally Ceji’s stock of Diaclones was the fact that every single wave 2 Transformer could be traced back to a Ceji Joustra Diaclone release. 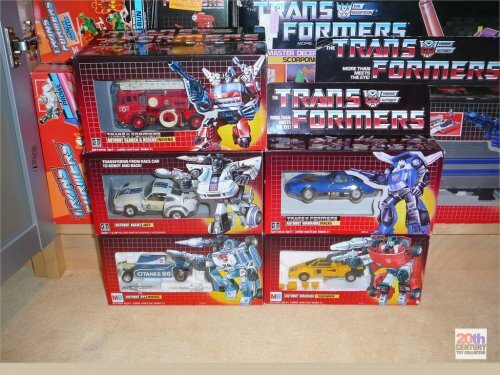 Every single wave 2 Transformer… but one. Sideswipe does not add up! Look at who the odd one out is there.. Sideswipe! 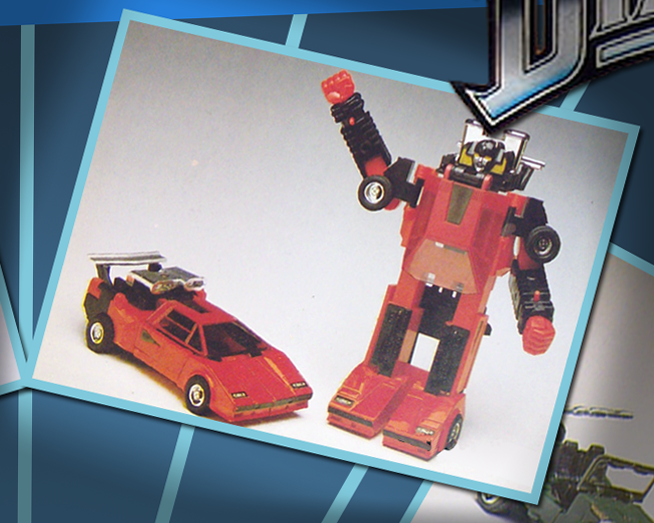 For some reason, that was not clear to me back then, Sideswipe could not be directly traced back to a Ceji Joustra Diaclone. I remember I kept bending my brain trying to think of an explanation for this anomaly in an otherwise perfectly sound theory. It was like a puzzle that fell into place almost completely, but there I was standing with the last piece of the puzzle in my hand….. which did not fit. More time passed and although I was now 100% certain of the special origin of MB’s second wave of Transformers, that Sideswipe anomaly kept nagging me every time I looked at the MB Sideswipe packaging. Something just didn’t sit right. Thankfully, the most important key to solving this puzzle came last year when fellow Dutch collector Argus alerted me to a thread on the Dutch Transfanclub forums. In this thread a forum member by the name of Gigatron was showing some photos of his collection. In between some of the G1 photos something stood out immediately. That’s not a Sideswipe inside that MB Sideswipe box, but a Sunstreaker! I soon got in contact with the owner who turned out to be a really nice guy. He clearly remembers buying this particular Sunstreaker inside a Sideswipe box in a toy store in 1986 (the Bart Smit toy store in Sliedrecht, the Netherlands to be exact). What struck me was that he was so used to having this Sunstreaker that he never thought twice about it being inside an MB Sideswipe box. He also hadn’t made any special mention about it in his original collection thread on the forums. To me this made his story sound all the more legit. Still, one swallow does not a summer make!! It was beginning to get clear to me that I needed to take a more serious look at the MB Sideswipe situation and I decided to consult two owners of MB Sideswipes that I knew of: two fellow MB Transformers collectors who I’ve known for a while and have come to trust; Dutch collector Ferdy and French collector JB. Back when this correspondence took place we both agreed that the seller was obviously wrong and this was just a mistake. Ferdy had meanwhile found a replacement styro insert from an Italian GiG Sideswipe to complete his MB Sideswipe and we thought nothing further of it. 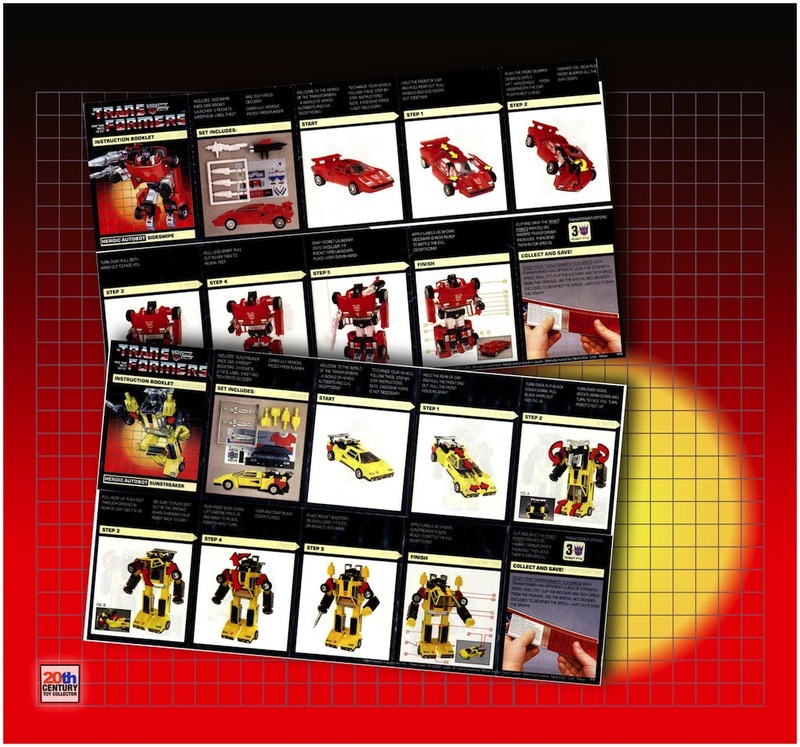 Fast forward one year and, against the light of a possible Sunstreaker/Sideswipe packaging mix up, this US seller’s story started to make a whole lot more sense! If MB sold Sunstreakers inside Sideswipe packaging it is not surprising that an empty MB Sideswipe box has surfaced online together with a Sunstreaker styro insert. I do remember the item as I knew it was odd and from Europe. Unfortunately, I really don’t remember much more than what I told you about it. But I am glad that you have the proof that I told you the truth. Unfortunately not a lot more info, but we did have the confirmation he got this MB Sideswipe box with Sunstreaker styro from Europe! It also felt good that the seller was made aware that his story is no longer doubted, as he seems like a nice guy. As you can see that’s an MB Sideswipe box there on the left and that’s a Diaclone Sideswipe styro in there! Hmmmm…. does this mean that MB did actually sell MB Sideswipes with styro inserts? Well, not necessarily. You see, just like Ferdy and me JB had bought the styro foam seperately, because his MB Sideswipe came with no insert at all! He remembers buying his MB Sideswipe from a French vintage toy store a couple of years ago and that it came that way. I’ve had a similar problem to yours, since I bought my Sideswipe in Lulu Berlu, the famous vintage toy shop in Paris and, although the set included sealed instructions and labels, the car had all labels applied; I logically thought that it came from somewhere else. [...] There was also no styrofoam in my box, so I bought a used Italian Diaclone box and styrofoam, that I will keep until I can find a nice incomplete Japanese one. 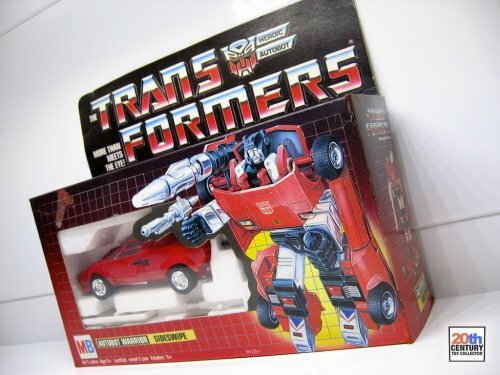 Of course, this case doesn’t prove or disprove anything, but it’s still remarkable that this third MB Sideswipe box also did not come with any original Sideswipe insert, be that styro foam or plastic bubble. I bought this Sunstreaker inside a Sideswipe box (a looooong time ago) at the Utrecht Collectors Convention. Two birds with one stone, because I could use everything. 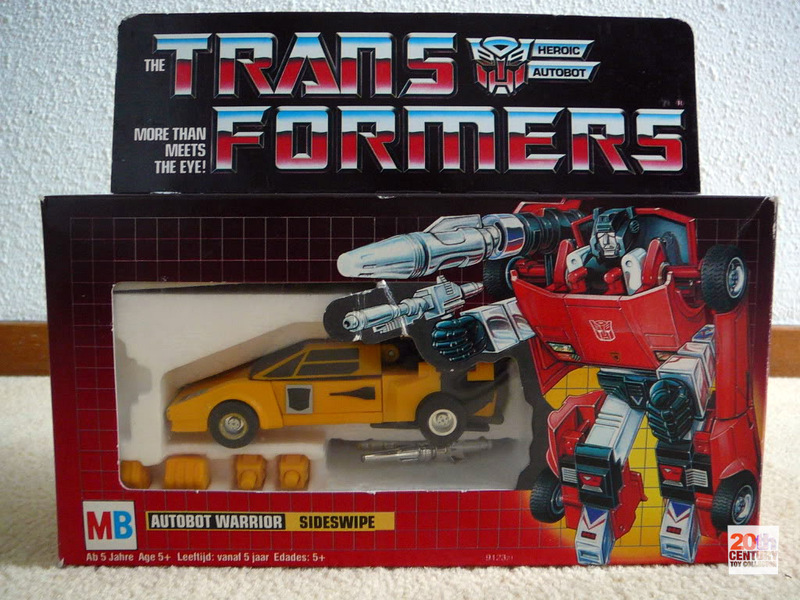 Two birds with one stone refers to the fact that he had a loose Sideswipe (inside a plastic bubble insert) lying around and an empty American Sunstreaker box. Thinking he was fixing an obvious error he removed the Sunstreaker from the MB Sideswipe box and put it inside the Sunstreaker box. He then put the loose Sideswipe with bubble insert inside the MB Sideswipe box and that’s what he sold to me. Amazing, I thought to myself. Even my own MB Sideswipe box originally came with a Sunstreaker in styro! Together with Gigatron’s and Ferdy’s cases this was the third totally independent confirmation of what my friend Maz quickly dubbed “MB Sunswipe”. Speaking of my friend Maz, he would deliver yet more proof that the MB Sunswipe was a bona fide packaging mistake variation. In September of 2012 yet another MB Sideswipe box with a Sunstreaker turned up! This time on eBay. It hailed from France and went under an unassuming auction title. If there was any lingering doubt left in my mind that MB sold Sunstreakers in Sideswipe packaging, it had now totally evaporated with this fourth independent confirmation. But here we have a Sunstreaker that is packaged inside an MB Sideswipe box, comes with an instruction booklet that shows a different transformation (that of Sideswipe) and comes with a Sideswipe sticker sheet, which means you’ll have to be creative placing those on your Sunstreaker, because most of them don’t fit! It’s really the most outrageous packaging mistake that MB made. Not only was the colour wrong, they sold a completely different toy to the one shown on the box! Now that we’ve seen at least some evidence that MB sold Sunstreakers inside Sideswipe packaging a question comes to mind. 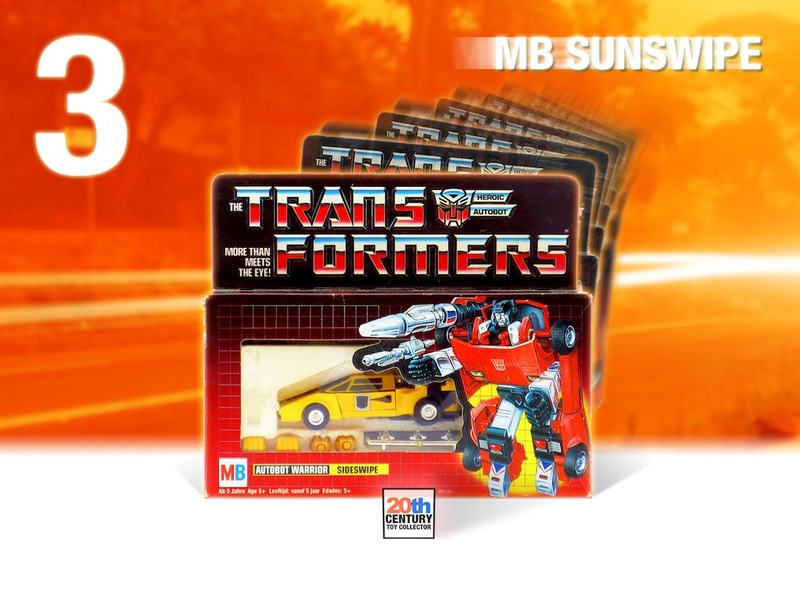 Why on Earth did MB sell Sunstreakers in Sideswipe packaging? 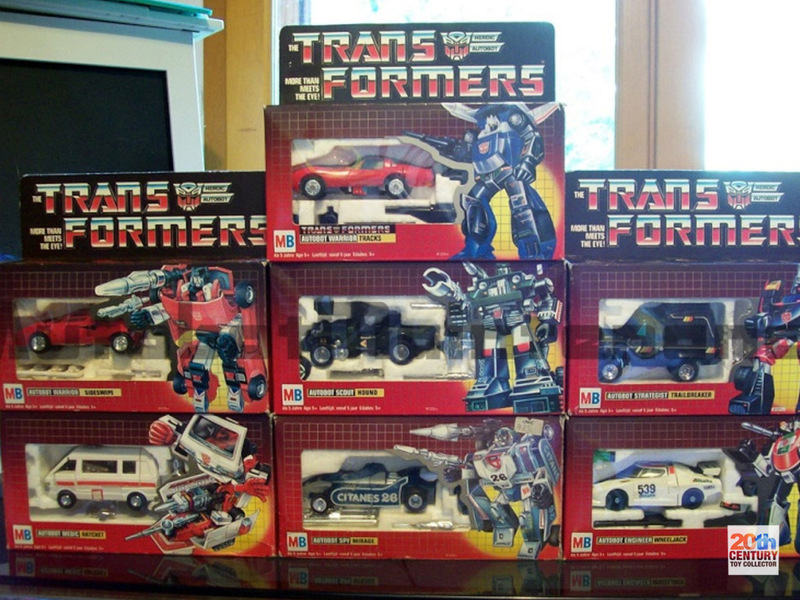 Or more specifically, where did these Sunstreakers come from and why did they put them in Sideswipe boxes? I will try to answer both questions. Let’s begin with the first one. MB Shockwave and ex-Ceji Diaclone stock! The interesting thing about this photo is that it shows an MB Transformer and old Diaclone stock from Ceji, more or less proving that MB was in possession of Ceji’s Diaclone stock in 1985. So, why do I bring up this prize contest again? Well, it shows a Joustra Diaclone Countach right in front of Shockwave’s box…. and as you can see it’s a yellow Countach! This answers the question of where MB got their Sunstreakers from. These were part of Ceji’s Diaclone stock that they acquired! This is pretty exciting, because if we now go back to our Joustra and MB checklist, we can finally draw the last connection!!!!!!!!! Suddenly everything makes sense and the last piece of the puzzle fits! The reason why I previously held a last piece of the puzzle that did not fit is because I was holding the wrong piece. It was not an MB Sideswipe that needed tracing back to a Ceji Joustra Diaclone release. It was a Sunstreaker, a.k.a. MB Sunswipe! You will notice that I struck through the name of Sideswipe. 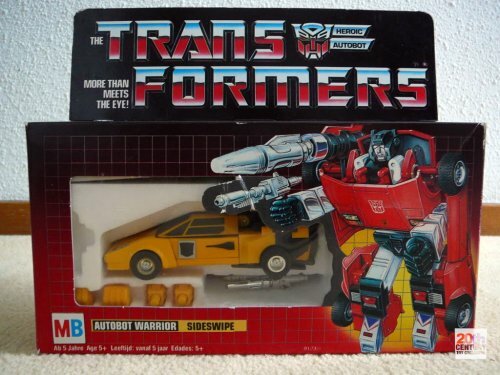 This is because, in addition to the existence of the MB Sunswipe variant, I do not believe that MB ever released a Sideswipe in Europe in 1985. I can understand this might sound a little controversial to some, but the reason I think so is because I firmly believe MB did not have any other sources of Autobot cars at that point in time. All the Autobot cars that MB released in 1985 as part of their second wave of Transformers were sourced from one supplier: Ceji. In fact, their complete second wave was sourced from Ceji. Every single one of them. They were mostly Takara manufactured Diaclones, while Optimus Prime and Megatron were Ceji manufactured. But they all came from Ceji. 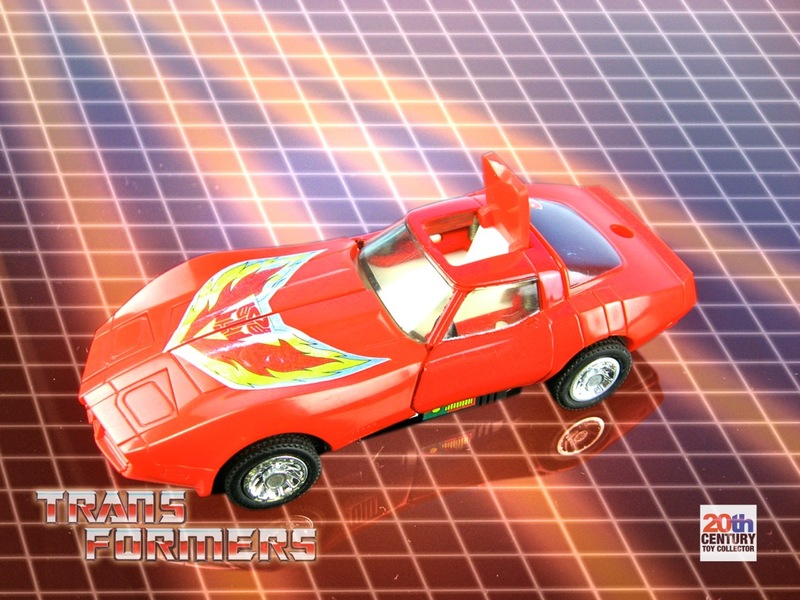 And Ceji did not have any red New Diaclone Countach LP500s, a.k.a. Sideswipes in their Joustra Diaclone line. Furthermore all known MB Sideswipe boxes found so far all point more towards the existence of an MB Sunswipe, than they do towards the existence of a proper MB Sideswipe. Devil’s advocate again: “So, mister smarty pants. If MB only released Sunstreakers in Sideswipe boxes and no Sideswipes, why on Earth did they make an MB Sideswipe box and instruction manual then?? It doesn’t make sense!” Well, that’s true. But I think it’s another honest to goodness mistake that was made and here’s a possible explanation. Keep in mind, I’m just theorizing here. When MB took over Ceji’s stock they could pick and choose which robots they needed for their Transformers line. Ceji had many Diaclone robots in their line up that were not part of the Transformers universe, so those were not interesting to MB. An inventory would have been made of what stock Ceji owned and which SKUs were suitable for rebranding to MB’s Transformers line. It is quite possible that this was done all quick and dirty. It might have been something simple as using the Ceji dealer catalogs as reference, which is not a crazy idea to begin with, because these contain details like assortment numbers, dimensions of packaging and most important, photographs of the items. 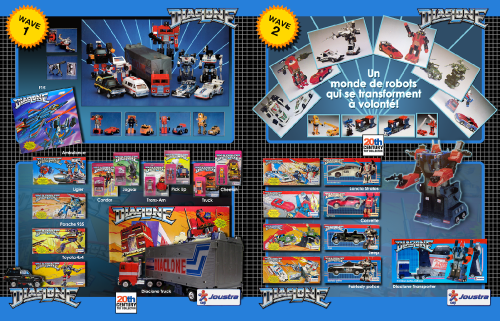 It might have been a simple process of putting the Ceji catalog and the Hasbro catalogs next to one another and matching the toys from one catalog to another to determine which Diaclones could be used as Transformers. As we have seen, the Ceji Joustra Diaclone Countach is photographed in the 1985 Ceji Revell dealer catalog, but that was the red version, while the actual stock was yellow. 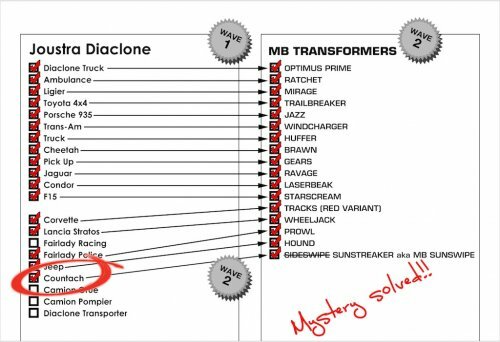 It’s not outside the realm of possibilities that whoever was responsible for determining which items from Ceji’s stock could be used made a false match between the red Diaclone “Sunstreaker” from the Ceji Revell catalog and Sideswipe from Hasbro’s catalogs. Anyone who thinks these kind of stupid mistakes do not occur in enterprise level companies, let me tell you: they absolutely do. And more than you would expect.. The first two entries of that list are the Diaclone Car robot No.1 Countach (Sunstreaker) and the No.15 New Countach (Sideswipe). 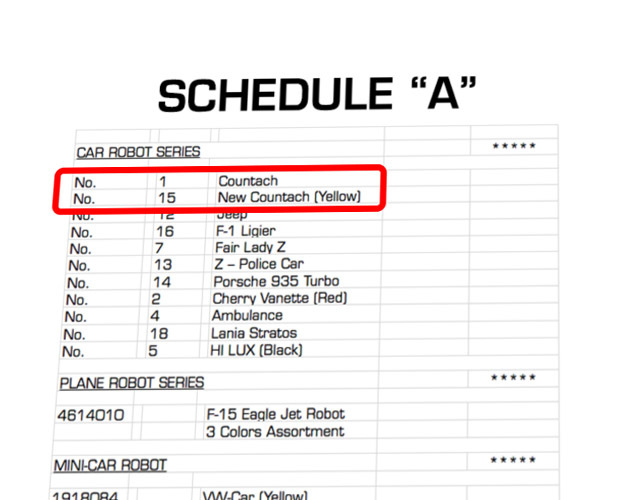 For some reason, the No.15 New Countach is described in this document as “New Countach (Yellow)”, but the New Countach was not released as a yellow Countach in the Transformers universe, but as a red Countach, i.e. Sideswipe. It is assumed that if the bios and tech specs of Sunstreaker and Sideswipe were indeed mixed up, that this is the most probable cause of the mix up. It is therefore also quite possible that Hasbro/MB used this very same “Schedule A” document in mainland Europe in 1985 to erroneously determine that the yellow Countachs they had acquired from Ceji were Diaclone Car Robot No 15′s, i.e. Sideswipes!! Now who wouldn’t be fooled by these two hoodlums? And who could stay mad at them? Whatever the exact cause, Sideswipe obviously made MB’s list in error. 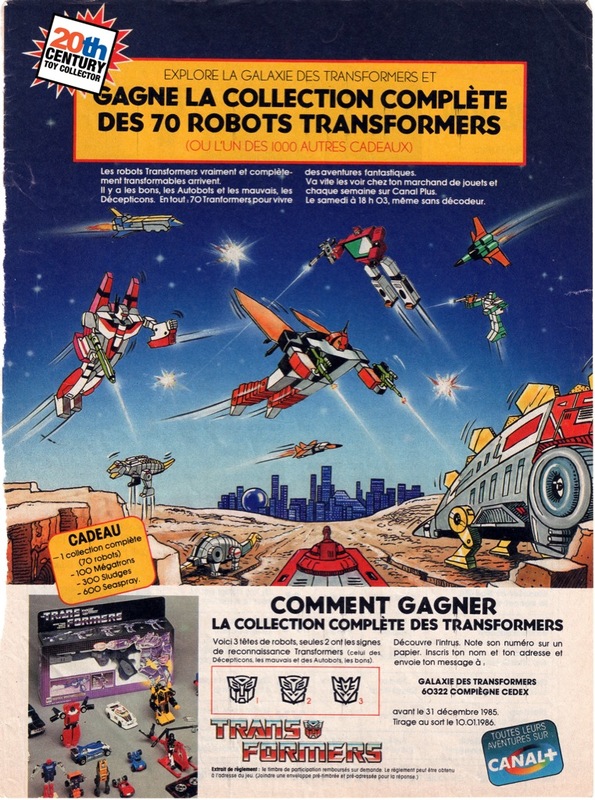 This list was consequently used to design European versions of the Transformers packaging, translate instruction manuals into four languages and to create photographs for catalogs. By the time the error might have been detected it was probably already too late and too expensive to fix. Not too overly concerned with little details Ceji and/or MB decided to put the product on the market anyway even if the packaging and included instruction manual were incorrect. To say that quality assurance in the production processes of the MB-Ceji cooperation was poor is an understatement. I mean, they made Optimus Primes with red feet instead of blue, they put red Corvettes in Tracks packaging instead of blue Corvettes, they put Thundercrackers inside Starscream packaging and they even produced yellow Constructicons instead of green Constructicons! Is it really far fetched to believe they made this mistake and sold Sunstreakers inside Sideswipe packaging? I think not! It fits perfectly with the picture we have of those early Transformers years in continental Europe where MB was responsible for this toy line’s sale and distribution! There was obviously a rush to get the product out in time to retailers before the end of the year, because that’s where most toy companies make a very significant chunk of their total revenue for the whole year. Miss that all important period and you’re screwed. Just like the Red Tracks problem was “fixed” in Europe a year later with the release of a blue Tracks, a proper Sideswipe was released then as part of the same schedule. But again, this was not an MB branded release, but a Hasbro branded release! Just like the blue Tracks it also came in a proper plastic bubble insert and the total package was manufactured and printed in Japan as most Transformers normally came in the early years. By this time MB was being supplied directly by Takara instead of using old Ceji stock and had started branding Transformers with the Hasbro logo instead of their own logo. 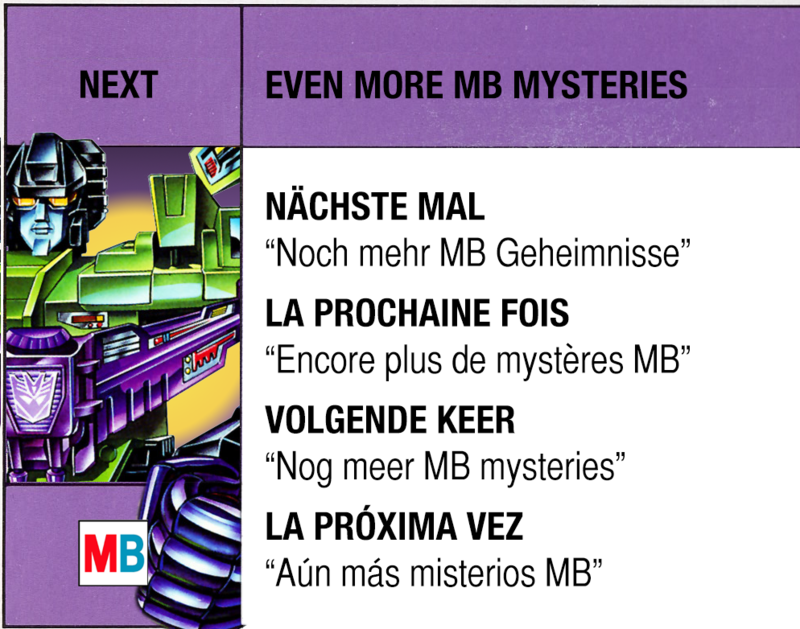 The few reports of MB Sunswipes known to me are from France and the Netherlands, which is to be expected, because MB did the sale and distribution of Transformers in those countries (and several others as mentioned before). The MB Sunswipe is very rare, although more specimens have been reported/sighted than the MB Thunderscream. As with the MB Thunderscream packaging mistake I believe that many Sunstreakers have been removed from their MB Sideswipe boxes over the years by unsuspecting sellers, collectors and dealers. This, in turn, only decreases the chances of finding one as time goes by. 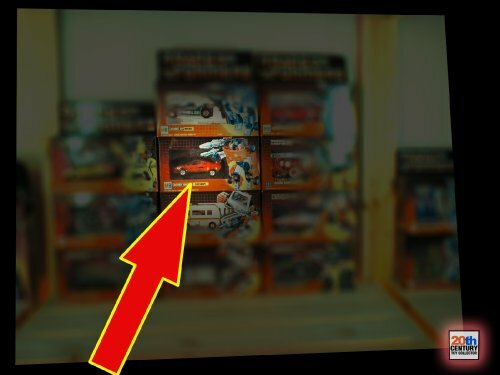 The main reason why I went into such detail about my hunt to investigate the various MB Sideswipes out there and going over them case by case is to illustrate how easy it is to assume that a Sunstreaker does not belong inside MB Sideswipe packaging and to handle accordingly, i.e. to seperate the Sunstreaker and the MB Sideswipe box from one another. Note: Enterprising individuals who think it’s easy to create these packaging variants themselves by putting a random Sunstreaker inside an MB Sideswipe box or a random Thundercracker inside an MB Starscream box will be disappointed. Because of their special heritage (ex-Ceji stock) these two variants can easily be identified, just like the MB Red Tracks. Sunset photo used as background in this article by Bo Insogna. Used with author’s permission. Anyone else I forgot to mention!! Just one word : Sublime! Another great addition to your MB series of articles, great read! Another fascinating read! Well-worth the wait! Thx Martin! As far as the Ceji Joustra Diaclone Fairlady Racing is concerned, I’m afraid I have no unequivocal answer to that yet. I guess you could ask the same questions about the Ceji Diaclone Camion Grue and Pompier, because those were suitable for inclusion in the TF universe as well as respectively Smokescreen, Grapple and Inferno, but they never made it to the MB line. All three happen to be 1985 bots (going by the original US chronology), but then again Tracks was also a 1985 character and that one did end up in the MB line as part of wave 2 (although it was a colour variant). One possibility is that Ceji never got around to releasing the Fairlady Racing and the two Camions. None of them have turned up yet, while the Corvette has made several appearances already. This is just a hunch of mine. Nothing more. It might just as well been a mistake made by MB as you suggest. I hope we’ll be able to solve that mystery in the future! Very interesting article. This also proves something that I have started to doubt if I actually saw this correctly. A yellow Sideswipe at a Bart smit in Enschede around 1985/86. This probably was a Sunstreakerin the wrong package. A big deal now, but then I’d rather have a correct version. great detective work and beautiful pictures! 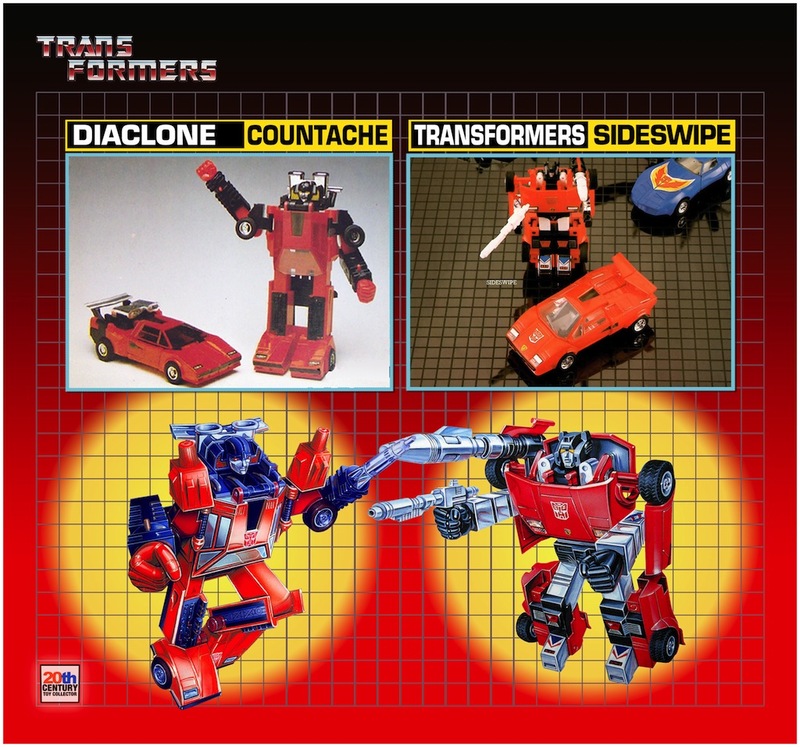 Ironically, Hasbro’s artwork for Tracks is a recoloured (from red to blue) and slightly altered version of the artwork for Diaclone ‘Tracks’. 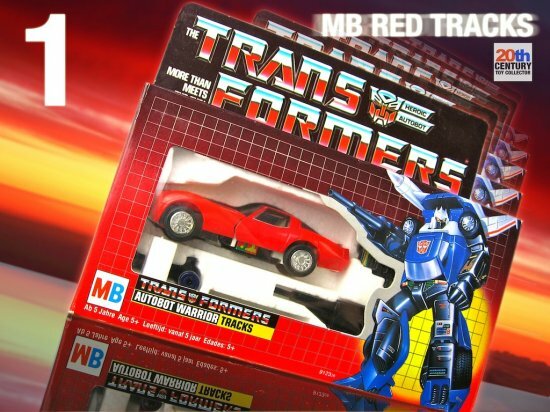 When i bought my 1st transformer it was the Red Tracks in MB box. It was in the local toyshop and i allway wonderd why it was red and the cartoon tracks was blue? I allways hang on to it and when later again picking the transformers up because it was so cool. I was one of the first showing the red tracks here in Holland to other collectors and later to friends in the states and all said it must be a fake or KO. When i said i bought it when i was youn alot og none believers where out there! I guy believed me and made an offer of $800……… i could not believe it …………..yes i sold it… boohoo ..no wishing i didn’t!! Hello i am abig fan of transformers variants and iown a few of them ..i have ared tracks and a blue mexican thundercracker plus others .. how do i know if my tracks is a real one .. I have been surfing olnine more than 3 hours today, yet I never found any interesting article like yours Karin Barclay: Where can bicyclists go in county? | Daily Camera: Letters to the Editor. It is pretty worth enough for me. In my view, if all web owners and bloggers made good content as you did, the internet will be a lot more useful than ever before. Carl, if your Red Tracks has a copyright on its back that says only “TAKARA JAPAN” it is the original Japanese Diaclone version, if it has Takara and Japan and (c) and dates, but no runsign and no Autobot symbol on the hood sticker, it is either a Joustra DIaclone Corvette or a GiG AutoRobot Corvette – both vintage and original Takara, no fakes. If it has the same copyright with the dates, but has an Autobot sticker on the hood flames, and the blue wings have a sticker featuring a square isntead of a “D” – or even a rubsign on the chest – it;s an MB Transformers Red Tracks. If it has Transformers features, but the copyright says China, it;s the E-Hobby reissue “Road Rage”. Fascinating article. I wonder if you have any information about something strange I saw as a child. 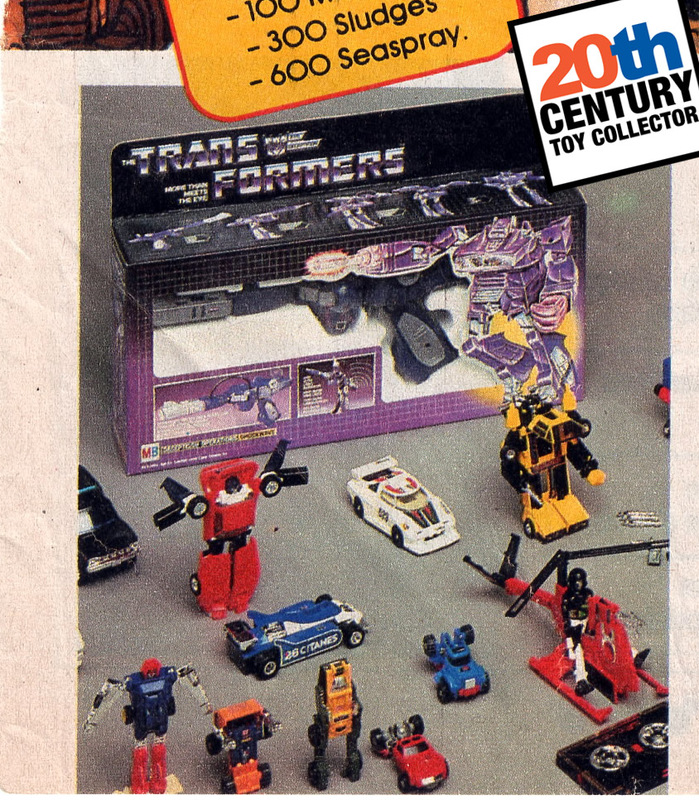 This would have been around 1986 as I’d been collecting Transformers for a while along with reading the comic and watching the cartoon. I went to Zodiac Toys in Bexleyheath, Kent, UK and was extrremely excited to see not just a load of Dinobots but Swoop – a Transformer I had never seen available, and was starting to suspect wasn’t really available in Britain. It was only when I picked it up that I realised it was actually Snarl in a Swoop box. It was the only one there. I didn’t buy it; and I’ve always wondered how that shop came to have that figure in that box. Please say you didn’t give up on this project. It’s an amazing body of work and a “one stop shop” for anything related to MB TFs. Your passion on the subject really shows through your work.